Guy Debord's accounts of the massive strikes by miners in Franco's Spain, translated into English for the first time. In Spain, the summer of 1963 was marked by a second wave of worker attacks against the Franco regime. The first threatening reappearance of the Spanish proletariat -- twenty-three years after the first defeat of its revolution, following the civil war against local and international fascism -- had been the first wave of strikes in the spring of 1962. Despite the fact that any strike was illegal since Franco's victory, these strikes, which were generally victorious, extended throughout almost all of Spain; they began in the coal mines of Asturias. Between the last week of July and the end of September 1963, the Asturian miners organized a 60-day-long strike that brought together between 40,000 and 50,000 workers. Ever since the success of 1962, agitation in the Asturian mines hasn't ceased. Conflicts over working conditions and selective strikes have been continuously pursued. This time, a spontaneous strike at a single coal mine was, in a spirit of solidarity, extended everywhere in the mining regions of Asturia. The metallurgists in Miaros momentary joined, but their demands were quickly satisfied. Towards the end of the movement, several strikes exploded among the miners in southern Spain (Rio Tinto and Puertollano), and agitation won over workers in the lead-producing region (Jaen). Nevertheless, at that moment, the Asturian movement lost its force and the strike didn't spread to Catalonia (where Barcelona is the other great center of industrialization and the worker movement in Spain), the Basque country or Madrid. The miners' demands, which were economically rather weak, concerned salaried workers because the rise in the cost of living over the course of the last 16 months had eaten away at the increases won in 1962; but they weren't limited to this one aspect alone. They also concerned working conditions and vacations; the metallurgists in Miaros had won a month of paid vacation per year; the miners immediately added this demand to theirs. Nevertheless, the principal demand of the miners concerned the right to be directly represented by their own delegates, refusing the "vertical" union [structure] of Franco, in which workers and managers are obligatorily organized together. And so the strike was directly political; it was a contestation of one of the bases of the regime that the Spanish bourgeoisie had abandoned in 1936-1939. It was an open struggle for dignity, and thus a show of force to the regime, which is detested by all Spanish workers. The forms of the Asturian miners' strike show their independent will. Each mine shaft chose its own delegate and, through clandestine meetings, the delegates led the strike. Not recognizing the union, the strikers -- to present their demands directly -- sent the government in Madrid a group of miners stricken with silicosis. They repeated that they had no other representatives than themselves. The solidarity of the workers in the region is constantly manifested. As in 1962, those who do not participate in the strike have experienced the insult of grains of wheat -- food for chickens, symbols of cowardice -- being thrown before their respective doors. The fisherman of Bilbao worked after their normal shifts had ended to be able to provide the miners with fish. Those miners still in possession of a small cultivated plot worked it with other comrades and shared its produce. Small businesses in the region supported the strike by individually distributing food to the workers in their neighborhoods. The Asturian miners say that the money collected abroad for them in 1962 was never distributed: it has remained with the bureaucrats in Prague (Stalinists) or Touloise (Socialists in exile) so as to finance their propaganda. They request that money be given directly to the families of the strikers. The role of the old political organizations of the Spanish proletariat, all of which are seriously discredited by their errors during the revolution and civil war, is currently very limited, while all the others -- the anarchists, the Stalinists, the Socialists, the P.O.U.M. -- still possess clandestine networks. The most active with respect to the Asturian movement seems to have been the union alliance, constituted by anarchist militants and Socialists, but also many young workers who do not adhere to precise ideologies, on the one hand, and the Popular Liberation Front, which is a recent organization of Castro-like style and whose initial recruitments were among the intellectuals and students, on the other hand. The Communist Party is particularly scorned by the proletariat because of its policy of including all the Spanish classes -- including the monarchist bourgeoisie -- so as to peacefully and "democratically" obtain the replacement of the Francoist dictatorship. Thus, the Communist Party tends to guarantee capitalism that the politically essential changes will not risk becoming revolutionary. This political directive is well distributed in Spanish by Radio Prague. In 1962, the Franco government, frightened by the extent of the strikes, tried to hide their very existence for as long as possible. Finally, it had to admit the existence of illegal strikes as well as salary increases. After the strike ended, the repression was limited to the deportation of a small number of militant workers. 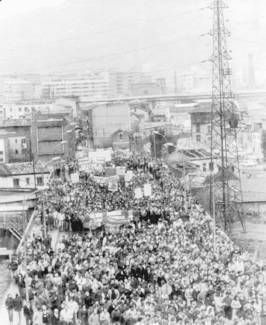 This time [in 1963], the existence of the strike was immediately recognized by the government. But it was technically justified by the global crisis in coal mines due to new sources of energy -- a crisis that is real everywhere in Europe (attested to by the recent strikes by French miners and Belgium miners in Borinage) and particularly in Spain, where the extraction levels are not profitable, especially in the perspective of European economic integration. At first, the authorities responded with a series of lock-outs; then they proposed a debate on the global future of the mines with the union. The miners refused such a debate. With each official reopening of the mines -- there had been several irregular and ridiculous attempts to do so; eventually there were attempted every Monday -- the managers were forced to agree that there weren't enough miners present to organize the work teams and declared a new lock-out. At the same time that the government left the strike to sink itself due to the exhaustion of the workers' financial resources, it exercised all of its power to [try to] prevent an extension of the strike, which might overthrow it. The government's weapons were not only economic concessions (as in Miaros), but also an extremely violent repression by the police. Some miners were arrested and imprisoned; many of them were tortured, as well. In tandem with this repression, which was hidden as much as possible, but which had already aroused public protests from a few Spanish intellectuals, the Franco government organized a spectacular trial of the anarchist menace. Five anarchist militants were arrested after -- or even before -- several very weak bombs exploded, [allegedly] as a protest against tourism under the dictatorship (the influx of tourists from the rest of Europe increases every year and constitutes an essential contribution to the Francoist economy). Two Spanish anarchists were garroted (a deliberately medieval punishment). Three young French people were condemned to 15 to 30 years in prison. The extent of the Asturian struggle and the repression that still continues will certainly weigh heavily on the consequences of the crisis of Francoism. The Asturian miners occupy an unforgettable place in the history of modern Spain. In 1934, their armed insurrection allowed them to take power in the whole region; it was only after a week of military operations, principally conducted by the Spanish colonial army, that the Asturian Commune was defeated. On both sides, this armed confrontation was the prelude to general civil war, in the course of which the preceding generation of these very Asturian miners [of 1962-63] would become the famous dinamiteros of the battles in Madrid and Guadalajara. Thus, the Asturian miners of today are at the center of the contradictions of modern Spain. Their current demands are simultaneously acceptable and unacceptable. In principle, they (the right to strike and the right of union pressure to regularly increase salaries) are acceptable to modern capitalism. But in the period in which we find ourselves, the modernization of Spanish capitalism (attempted with the help of American capital) has advanced far enough that one might think that the social base of the dominant class has been profoundly modified since 1936. The predominance has passed from [land] owners to industrial capitalists. These capitalists, attempting to construct a new industry that is oriented around a competitive role in the European Common Market, have not found in the superstructure of the Franco regime a power that is adapted to their activity or their maximum profits. (The declarations of the modern faction of the Spanish clergy in favor of the strikers of 1962 express the interests of this capitalist modernization; the granting of a month's vacation is equally characteristic.) Nevertheless, it is very difficult to gently replace the power of the Franco regime, which is primarily the exercise of political power by the military caste, that is, by the repressive forces that broke the proletarian revolution [of the 1930s]. The Franco government cannot become "democratic" on its own, and since this regime remains the method of governing Spain, the demands of the miners will remain unacceptable. Any liberty for the working class is unacceptable to a power whose function is nothing other than the suppression of such liberty. The replacement of Francoist power is thus imperiled precisely by the pressure of the working class, which the regime is currently pushing towards radical measures. The workers are the principal force that can sweep away the Francoist regime, but they will not do so in the hope of establishing a more modern capitalism and a formal democracy, as in [post-WWII] Germany or France. In Spain, memories retain a great political power. Political evolution, from the present backwards, has been hindered, indeed, placed in hibernation, since Franco's victory. And so, economic evolution has once more led Spain, in special conditions, to a rendezvous with global capitalism and its problems. The current ascent of the Spanish proletariat still has not managed to produce a revolutionary organization adapted to its new possibilities, and this absence has naturally hurt the extension of the movement to all of Spain -- an extension that would suffice to destroy the Francoist regime and, along with it, all of the social order that could not surpass the level of that regime. But, at the same time, the fact that the Spanish working class is not lead by a reformist or Stalinist party aggravates the position of modern capitalist interests, reduces their margin for maneuver and ends up in an extreme contradiction. In its permanent incapacity to organize a power adapted to its ends, the Spanish dominant class pronounces against itself a judgment that [only] the proletariat can execute. Debord's fellow situationist, Raoul Vaneigem, was born in Borinage; another situationist (and ex-Lettrist), Andre Frankin, was also Belgian. For strikes in Belgium, see Debord's letter to Frankin dated 24 January 1961. See "Geopolitique de l'hibernation" (The Geopolitics of Hibernation), in Internationale Situationniste, #7 (Paris, April 1962). For more on Spain in the 1970s, see Commentaries about Wildcat Spain in the Run up to the Second Revolution (1978).